Congressman Upton wins the Polluterharmony special prize! Polluterharmony is pleased as punch to announce this year's polluter lover prize winner! 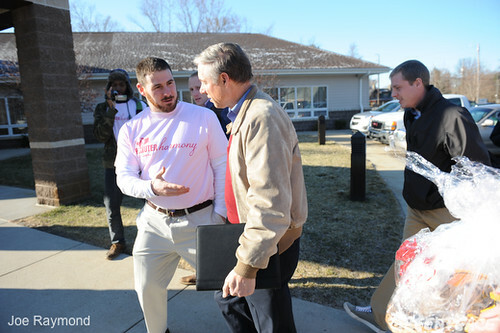 Freddy Kalamazoo/Congressman Upton's love of big polluters like Koch Industries and his relationship with people like American's For Prosperity President Tim Phillips made him a clear choice. Thank you to all who submitted stories of Upton siding with dirty energy and attacking the EPA and those that voted on profiles and success stories on our page. 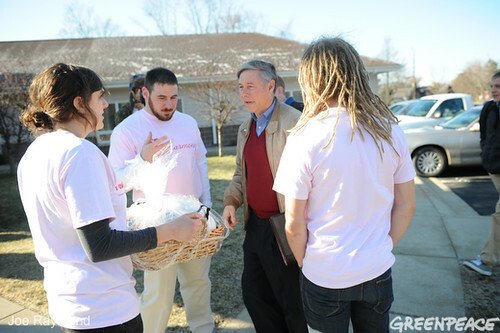 Our local representatives greeted Upton with a basket of goodies today at Coloma Township Hall in Michigan. At the townhall as part of Upton's "listening tour" they even asked Upton questions about his commitment to big polluters in front of other constituents. He was more than happy to oblige and talk about his support for gutting the Clean Air Act. We were also happy to hear the media talking about the delivery and the fact that we will be running the commercial featured on our site all day around Kalamazoo Michigan! Thank you Mr. Upton. For all of you other polluters and politicans, keep those relationships ahead of constituents and you might receive your own gourmet candy coal, multi-use massage and motor oil, or romantic cd of the sweet sounds of industry. Polluterharmony is pleased as punch to announce this year's polluter lover prize winner!